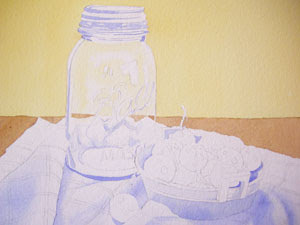 Using French Ultramarine Blue I paint in the shadowed areas of my still life. I like to do this for several reasons: this helps to establish the foundation, or bones, of the painting; it helps me to identify which direction the light is coming from; it creates an under-layer of cool color where I want the shadows to appear. You will see why this is so important very soon. To create the soft edges of color on the towel and in some of the other shadow areas, I use what I call my Softened Edge Stroke. 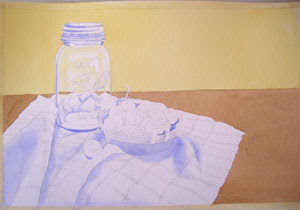 I apply a nice, rich, wet stroke of color in a small area, then clean the brush and tamp it on the paper toweling. I use the clean damp brush to pull a tiny bit of moisture INTO the stroke of color. The moistened edge creates a soft edge. It is very important to pull the liquid INTO the pigment and not to pull the pigment out into the clean, wet area. Pushing the water INTO the colored stroke will help to create a soft edge that does not have a funky line of dried pigment, because the water softens the edge to the white of the paper. I hope this makes sense. I would love to hear your comments! Please click the comment link at the bottom of the blog entry. You can also become a Follower!